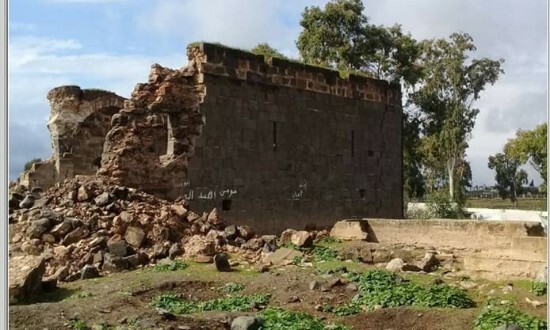 According to the DGAM and Idlib Museum, illegal excavations in the Daraa governorate have destroyed one of the most important water mills on the National Heritage List, which is an archaeological windmill. See the post by the DGAM here, and Idlib Museum here. Four people died in the World Heritage city of Bosra when their illegal excavation of the ruins collapsed. They were excavating near the Palace of the Bishops east of the Church of Sergus and Bacchus. Their names were Abdel-Halim Al-Issa, Nader Al-Humaydat, Ali Abdul Rahman Al-Humaidat. Read more on the amazing work here. The Syria Times reported on carpet weaving in Aleppo, where a craftsman is keeping alive the traditional knowledge of weaving rugs, carpets and tapestries on wooden looms. A group of Italian engineers and experts in Aleppo are working with local Syrians to teach them restoration skills for the souq, minaret and Umayyad mosque. Read more on the ANSAmed website here. The Regional Workshop on “Treating Stolen Cultural Property Recovery” organized by the Biladi Association with funding and support from the Norwegian Embassy in Beirut began on Thursday 15 February 2018 in Beirut. The workshop was attended by specialists in heritage and law from Syria, Iraq and Lebanon, under the supervision of a group of international experts working in this field. The workshop will continue until February 26, 2018. Its topics focus on international law, international conventions on the protection and recovery of stolen cultural property, case studies and successful recovery. Read more on the DGAM website here. Applications are now open for two ICCROM courses on First Aid to Cultural Heritage in Times of Crisis 2018, which aims to enhance collaboration between the cultural and humanitarian sector by streamlining activities and communication, and by enabling cultural responders to be integrated in overall humanitarian response efforts. 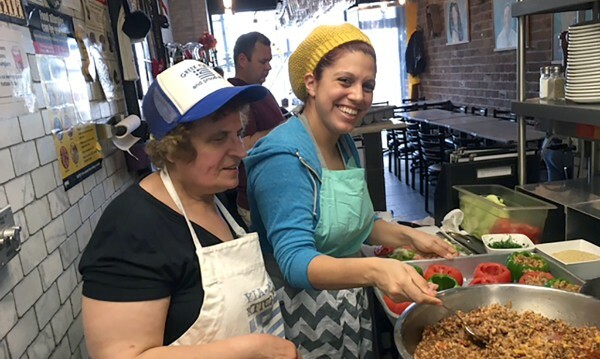 Syrian culinary heritage will be showcased in a fundraiser dinner at the South Beach Wine and Food Festival 2018, in Florida, where visitors can experience food, traditions, and stories from Syria. Read more on the South Florida website here. The Arabic Book and Culture Days in Istanbul, Turkey, will include work from Syrian scholars and writers. 2-11 March 2018 at at Üsküdar Bağlarbaşı Congress and Cultural Center. Learn more on the Daily Sabah website here. Mental Floss wrote about the collaborative program between a law firm and the University of Pennsylvania that are training dogs to root out stolen antiquities looted from archaeological sites and museums. The Armenian Weekly website reported on an art detective and her organization, the Walk of Truth NGO, which works to prevent the theft of cultural artifacts from countries including Syria. Good Worldwide reported about an Aleppo-born Californian musician who writes about Syria and records in Armenian. The National reports on a warning from UNESCO chief Audrey Azoulay about allowing extremists to commit cultural cleansing to drive religions and communities apart. MENAFN reports on the lecture by Sheila Canby from the Islamic Art department at the MET in New York discussing cultural preservation techniques in war-torn countries. Egypt Today discusses the Cultural Protection Fund, an initiative organized by the British Council in partnership with DCMS (Department for Digital, Culture, Media & Sport). In Syria, the CPF will preserve and revitalise the tradition of domed houses to offer accommodation for families.